Gorsuch’s record suggests he would take the court in a far-right direction doing irreparable harm to the health of communities, while failing to protecting wildlife, our public lands and restricting efforts to combat climate change. Earthjustice, the nation’s largest environmental law organization, believes that Tenth Circuit Court Judge Neil Gorsuch is an extreme and unacceptable choice for the Supreme Court of the United States and the organization calls on the Senate Judiciary Committee to reject him as unfit for any role on the High Court. “Judge Gorsuch raises serious questions about whether he believes the Constitution should protect all of us equally. His record reveals a consistent pattern of siding with the wealthy and the powerful while showing hostility toward the rights of women, workers, and the disabled, among other groups. “Our constitutional values of liberty, equality, and justice for all are bedrock principles upon which our democracy rests. It is essential that whoever is seated on the Supreme Court adheres to mainstream legal thought and can function as an impartial check on the power of Congress and the president. Gorsuch’s extreme views show that he is unsuited to being a check on power when necessary and is therefore unfit to serve as a Supreme Court justice. “Gorsuch has a lengthy record of decisions that seek to benefit corporations and restrict the federal government’s regulatory responsibilities. His decisions also reflect a history of limiting the rights of women, the disabled, workers, and many others. “A review of Gorsuch’s writings and decisions indicate that he would seek to overturn well-established Supreme Court precedents and prevent the federal government from enforcing bedrock environmental laws such as the Clean Air Act and Clean Water Act. “Gorsuch’s record suggests he would take the court in a far-right direction doing irreparable harm to the health of communities, while failing to protecting wildlife, our public lands and restricting efforts to combat climate change. “Earthjustice is committed to a federal judiciary and Supreme Court that safeguards the rights of everyone in our country. We support a Supreme Court composed of judges who truly represent and understand that the issues faced by all of us are critical to the functioning of our democracy. Gorsuch has a history of wanting to limit federal regulatory power. Gorsuch has a history of rulings against workers’ rights. 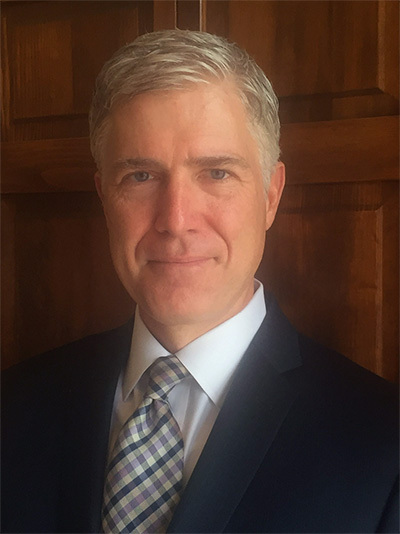 In Compass Environmental Inc. v. OSHRC, Gorsuch voted to overturn a Department of Labor fine against a company whose failure to properly train a worker caused his death. In another case, Gorsuch dissented from a decision upholding a National Labor Relations Board order that an employer pay back wages that were owed after the worker’s wages were improperly reduced. Gorsuch is a friend of big business. In a working paper for the Washington Legal Foundation, Settlements in Securities Fraud Class Actions: Improving Investor Protection, Gorsuch argued that the legislature and courts should make securities fraud class-action lawsuits more difficult to achieve. He has shown hostility to the rights of the disabled. In another case, Thompson R2-J Sch. Dist. v. Luke P., ex rel. Jeff P., Gorsuch ruled that a student with autism did not have a right under the federal Individuals with Disabilities Education Act (IDEA) to an education that would provide a chance to achieve intellectual and social skills outside the classroom. Gorsuch showed repeated antipathy for reproductive rights. In Hobby Lobby Stores, Inc. v. Sebelius, Gorsuch agreed with the majority opinion that corporations are persons and should not be required to pay for contraceptive coverage under the Affordable Care Act. Gorsuch protects police officers charged with excessive force. In Wilson v. City of Lafayette, Gorsuch held that a police officer was entitled to qualified immunity from an excessive force claim after the officer used his stun gun and killed a young man who ran after admitting that he owned marijuana plants that were growing in the area. The man was shot with the stun gun after running even though he wasn’t suspected of a violent crime.